Recently I was talking with friends about what role emotion should play in giving decisions. Some said we shouldn't let emotions muddle our thinking. "But I want to have an emotional connection to the people I help," another said. I found myself agreeing with both sides. We're emotional creatures (some more than others). Personally, I'm pretty high on the bleeding-heart scale. 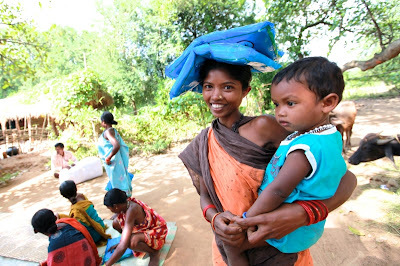 One thing I loved about Oxfam is that they do a great job documenting their work in articles and photography, so I could feel really connected to the people they work with. I put their pictures on my wall. I wanted to see their faces. Of course, I don't want to choose a cause based on how emotionally connected I already am to it. I don't want to pass up an excellent opportunity to help because I felt more pulled to a less effective cause. When it comes to choosing a cause, I want to act based on information, not sentiment. At the end of the year I'll reevaluate which charities to support, and I don't want to be muddled when I do that. But once I've chosen a cause, I give myself permission to fall in love with it. What I care about, after all, is not the cause itself but the human lives at stake. (For you, it might be animal lives as well, or the lives of people not yet born. But you get the idea.) So I look for a way to connect. 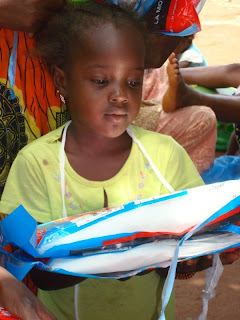 Against Malaria Foundation posts photos of most of its bednet distributions. It's a way to document that they're doing what they say they are - but for me, it's also a chance to see the human face of the work they do. The work I help them do. Seeing her face is a way of overcoming the blind chance that put me in the US and her in Mali. It's a way of making us neighbors. It's hard to feel warm and fuzzy about our donations going to dozens of distribution points around the world. We didn't evolve to feel an emotional glow about numbers. It can feel like we're sending money into some kind of oblivion. It's hard to feel motivated about that. That's why I imagine it going to her. I imagine how glad her family will be to see her reach her eighth birthday, eleventh birthday, twentieth birthday. I imagine all the things she can do now that she's not sick. That kind of glow is what my heart was made for. I choose what cause to support -- poverty, hunger, animal rights, the environment, etc. -- primarily by emotion, not logic; then I choose a charity within that cause based primarily on logic, not emotion. I find it a satisfying balance.